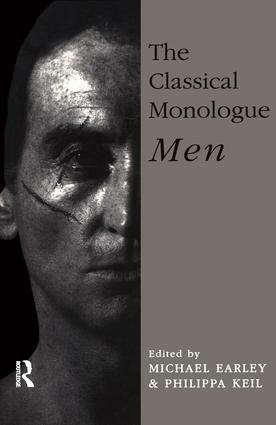 The Classical Monologue in two volumes, one for men and one for women, is a fresh selection of the best speeches from the repertoire of the classical theatre, from the Greeks to the beginning of the 20th century. These great dramatic monologues--from all periods and styles, all varied in tone and genre--make an indispensable actor's companion for auditioning, rehearsing and performing. Each monologue is accompanied by textual notes explaining any unusual vocabulary or syntax, and by commentary in which the editors offer interpretative points and practical advice in preparing the speech for performance. Both beginners and experienced actors will find The Classical Monologue a treasury of theatrical riches waiting to be released on stage. Alice. But here she comes, and I must flatter her. 1594) Christopher Marlowe I. London. A street. Enter Balthasar his man, booted. an thou drawn, sweet maid, till this be dead; an buried. Of death must soon awaken him? (1893) Oscar Wilde ARBUTHNOT. At the prospect of going away?] GERALD.